Reduce your carbon footprint by reducing energy. 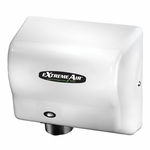 The eXtremeAir uses 80 to 90% less energy than traditional hand dryers. Our newest model, the eXt series, is the first and only high speed hand dryer to reduce power consumption to an industry leading 540 watts of electricity. That’s up to 3 X Less Power than other “green” hand dryers. The patented desighn is the most compact of any high performance hand dryer in the industry. It’s 43% smaller than old “industry standard” high speed dryers; yet, just as powerful. The eXtremeAir saves 95% versus the costs of paper towels.